The 30th annual Jimmy Fund Scooper Bowl starts tomorrow at noon at Boston’s City Hall Plaza. 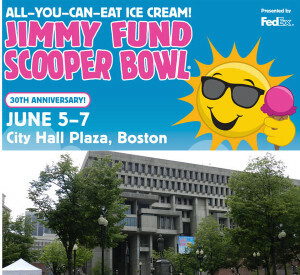 Though the weather is not going to be the best it should not stop you from participating in this “ice cream party” which benefits the Jimmy Fund. Tickets are available at the event $5 for kids under 10 and $10 for adults and kids over 10. If you really are an ice cream fan or just want to keep your options open for this 3 day event you can also buy a Scooper Pass for $20 which can be used for entry 3 times. We have included a video from WorldViewZ that we found on YouTube. It gives a good overview of what the event is like and what it is all about. For more information you can also visit the official event website at ScooperBowl.org.